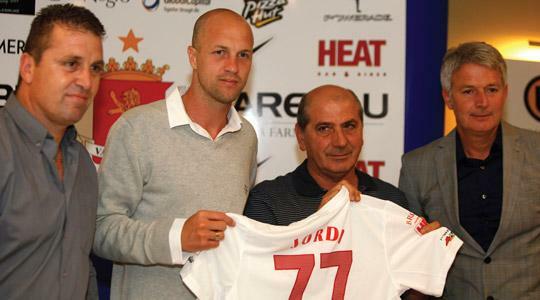 Valletta president Victor Sciriha (centre) with new signing Jordi Cruyff (left) and coach Ton Caanen. Valletta have their sights firmly set on regaining the Premier League title next season but their ambitions stretch beyond domestic success. Ton Caanen, their new Dutch coach, and Jordi Cruyff, the former Barcelona and Manchester United player who has also agreed to don the City shirt next season, yesterday declared their willingness to help their new club achieve their goals during a news conference at the Le Meridien St Julian's. Caanen, who has spent most of his fledgling coaching career with clubs in Israel and Ukraine, started his address by thanking Valletta president Victor Sciriha and team manager Nicky Saliba for putting their faith in him. "I want to thank Mr Sciriha and Mr Saliba for putting their trust in me," the straight-talking Caanen said. "I know that Valletta FC are a very big club in this country and that their fans are very emotional. I compare them to the supporters of Beitar Jerusalem and those of Feyenoord who have remained behind the team even in difficult times." Caanen revealed that he had no shortage of job offers in the past year before opting to accept Valletta's proposal. "After my last job in Ukraine, I took a year's sabbatical," Caanen said. "I lived in England for one year and there I had several job opportunities. "I had the chance to take charge of the reserves team of Tottenham Hotspur and was also offered a coaching role at Liverpool. "Before I decided to join Valletta, I almost signed a contract with Guus Hiddink to work with the youth academies of the Russian FA but we couldn't come to an agreement." "I visited Malta three times before I signed my contract with Valletta," Caanen, who has inked a three-year deal, added. "I wanted to get a good idea of the country and the level of football here. I think Maltese football is growing. "I'm here not only to work with the first team of Valletta FC but also to guide the club's youth coaches. "I've read that Valletta have been Malta champions 19 times and winning title no.20 would be nice. "I want the team to be successful by playing attacking football. We're here to entertain the fans and the media." Having watched several DVDs of Valletta matches last season, Caanen said: "I've seen DVDs not only of Valletta but of all the other teams in the Premier League. "Valletta's main weakness last season was their attack. Doding Priso did well to score 15 goals but if Valletta had better finishers in front of goal, they would have won the championship." Earlier, Sciriha also blamed the pedigree of their foreign players for Valletta's failure to retain the league crown. "Last year, we had the strongest squad in the Premier League but something went wrong because we failed to win the league and also lost in the FA Trophy final," Sciriha claimed. "Our foreign players were our main weakness. The bottom line is that they weren't up to standard. You can't have three foreigners and two of them are substitutes." Sciriha is confident that Caanen, who has a UEFA Pro Licence, will live up to expectations. "I had other options but I think we've made the right choice," Sciriha said. "I'm confident that Mr Caanen will prove me right. "As for Jordi Cruyff, I think he has to be regarded as one of the biggest stars ever to play in the Maltese league." The Valletta president revealed that the senior squad will train on a semi-professional basis next season with a view to turning full-time professional in the coming years. Progress in European football represents another objective for Sciriha who has challenged Valletta to advance beyond the first qualifying round of UEFA competitions in the near future. In a few weeks' time, Valletta will play in the Europa League. Apart from Cruyff, Valletta are looking to engage two other foreign players and two Dutch strikers are expected to start pre-season training with the team tomorrow. These two forwards, who turned out for clubs in Ukraine and the Netherlands last season, have been recommended to Valletta by Caanen but the latter is keen to gauge their performances during training in the coming days before deciding whether to offer them a contract or not. Caanen may be new to Maltese football but he has already gathered a lot of information about the complexities of his new working environment. Prime among these is the MFA training scheme whereby national team players have to report for training with the national coach for the first three days of the week. "I've been told about this training system," Caanen said. "The MFA think that this scheme is good for the national team but for the players involved, it's like having two fathers because they train with two coaches. "Ultimately, it's the clubs who pay the players. I honestly hope that there is a serious discussion on this subject between the clubs and the MFA in the coming months. "I think the players should train with their clubs. If the national coach asks me to have all the players for training one week or 10 days before an international match, I would give him the green light but the current situation is unbelievable." Cruyff agreed with Caanen. "In life you learn from mistakes," Cruyff said. "If you play a match on a Sunday, the next day is very important for the squad and the coach to analyse and discuss the performance of the previous day. "Feedback is important but you can't do this if some players are absent." Cruyff acknowledged that Caanen's appointment as Valletta coach was key to his decision to sign for the club. The former Barca stalwart admitted that, at 35, he is fast approaching the end of his career but he's determined to make his mark for Valletta. "If I didn't see ambition in this club, I wouldn't have signed," Cruyff, who holds a UEFA 'A' coaching licence, remarked. "Valletta want to go forward not only in domestic competitions but also by improving their youth set-up. "I'm 35 and I know that I haven't got many years of football left in me but I'm willing to use all my experience to help the team not only on the pitch but also by working with young players. "I also want to help the coach, to learn from him." Cruyff said he knew very little about Malta before learning of Valletta's interest. "I didn't know much about Malta before Valletta got in touch," Cruyff said. "I had some contacts with agents who had links with Maltese football but I heard many good things about the country and the lifestyle here. "This is going to be a very important year for me. I'm coming here to play and to discover what I really want to do in the future." Representatives of Valletta's main sponsors, namely Mareblu, Le Meridien St Julian's and Urban Jungle, were also present for yesterday's news conference. Saliba also announced yesterday that Valletta have renewed their contract with technical suppliers Nike for another three years.